It is now a perennial problem for fresh medical graduates and others in related medical sciences to secure placements in the nation’s tertiary health institutions for further training and specialisation. Also, some of them like fresh Dietitians and Nutritionists, specialists in the study of food and nutrition in relation to health, have only four institutions where they can go for their internship. These are the Lagos University Teaching Hospital (LUTH), Idi-Araba, University of Nigeria Teaching Hospital (UNTH), Enugu, University College Hospital (UCH), Ibadan and Obafemi Awolowo University (OAU), Ile-Ife. A national survey by the News Agency of Nigeria (NAN) indicates that the situation is so because of inadequate funding, lack of infrastructure and regulation of the number of medical students. Some stakeholders in the health sector believe that these were some of the factors hindering the absorption of doctors, pharmacists, medical laboratory scientists, radiographers and physiotherapy graduates in the institutions for internship or housemanship. NAN reports that it is mandatory for fresh medical graduates to embark on a 12-month uninterrupted housemanship/internship in approved hospitals and health institutions. However, in recent times, it has become increasingly difficult for this crop of medical personnel to get their placements. Some medical experts who spoke to NAN also identified insecurity in some parts of the country, increase in the number of graduates from medical institutions and inadequate health institutions as part of the problems. Others, they said, included lack of uniform curricula, non-functional general hospitals and lack of political will on the part of government officials. Dr Lekan Ojo, a Nephrologist and Senior Consultant with the Federal Medical Centre, Owo, Ondo State, said the country did not have enough institutions to cater for the teeming number of interns that were seeking for internship placements. “Many training centres have exceeded their quotas, yet they still go ahead to take more people until the council starts sanctioning them. “Many candidates also insist on where they want to do their internship because of payment involved. “This resulted in non-accreditation of many training centres because of poor funding from the government. “Also, there should be synergy between the regulatory agency, medical directors and the respective training institution as well as the Medical and Dental Council of Nigeria,’’ Ojo said. Dr Jide Idris, Lagos State Commissioner for Health, attributes the situation to the non-availability of spaces compared to the number of medical students being churned out every year from universities. “There are more medical graduates than the available spaces and the resources. “We are churning out more doctors, pharmacists and other medical personnel every year because everyone wants to study medicine and the universities are admitting students excessively. “The case is peculiar to Lagos because it is saturated,’’ Idris said. Dr Grace Ijarogbe, a Consultant at the Federal Neuropsychiatric Hospital, Yaba, Lagos, agrees that non-availability of spaces for housemanship posed a serious problem to effective healthcare delivery. She also said that funding and non-alignment of uniform curricular were major deterrents, adding that non-availability of spaces for housemanship was a serious problem. “I think it is the incapacity of government to pay for the internship period. “There are many teaching institutions across the country where they can train, and what is needed is a firm policy and restructuring of the academic timetable to accommodate every individual. “The different institutions graduate people with different policies and they also employ doctors with these policies. There should be a uniform timeline. “For example, if it is August or November that students are to be graduated or taken in, it should cut across all the institutions. “So, as they are being absorbed immediately, others will perhaps be leaving. It can also be twice a year,’’ Ijarogbe told NAN. recruitment can be in November and definitely, there will be overlaps. Commenting, Dr Oyetayo Jeje, a Senior Registrar at the Federal Neuro-Psychiatric Hospital, Yaba, said the difficulty was as a result of the number of graduates being produced yearly. Jeje, who is the President, Association of Resident Doctors (ARD), also blamed the insecurity in some parts of the country for the problem. “Lots of people, because of insecurity in the northern part of the country, do not want to go to that area for their internship or housemanship. “There is now a lot of concentration and pressure on a particular region where there are no security challenges. “The Federal Government can help in this area by intensifying the fight against terrorism,’’ Jeje said. In Ibadan, Oyo state, Dr Tosin Odulami of Ifetayo Hospital, said: “Government should scale up funding and rehabilitate tertiary hospitals so that many medical graduates will be admitted without putting further strain on the health institution’’. Also a pharmacist, Yemisi Oluwo, said that the issue of internship placement was not as difficult for others as that of doctors. “The reason why many pharmacists want to do their internship in a hospital is because of the attractive pay. “However, once you overlook the pay, there are many community pharmacies that have been approved by government to provide internship,’’ she said. In his contributions, Prof. Oluronbi Odunubi, the Managing Director, National Orthopaedic Hospital, Igbobi, Lagos, said: “We admit according to the dictates of the Medical Guild of Nigeria and West Africa. “The supervisory college prescribes the number of students we can take out of a list of students that apply in relation to our capacity. “We cannot take more than the quota giving to us as this may attract sanctions; we operate under strict guidelines and rules by the guild. “What they take into consideration is the number of patients, how many consultants and they will also tell you how many trainees you can have,’’ Odunubi said. Dr Theophillus Umeizudike, a Consultant Nephrologist at the Lagos State University Teaching Hospital (LASUTH), Ikeja, identified limited training positions and increase in medical schools as some of the factors. “There are limited training positions for internship in the last few years and this has hindered fresh doctors and pharmacists from getting placement for the mandatory one year housemanship. “In essence, there is a direct relationship between the number of training spaces for internship and the number being turned out by the various institutions,’’ he said. The Nephrologist said that to close the gap, there was need to create more training positions by encouraging the state governments to employ more consultants to manage the various state general hospitals. According to him, this will definitely provide the increased manpower to cater for the new trainees. Umeizudike said that the private sector or hospitals should be encouraged to engage more trainees than they currently do. “The state and federal governments can offer to pay these graduates while on internship. 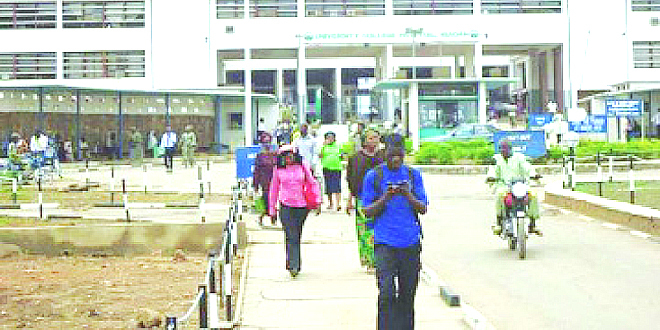 “The Nigeria University Commission (NUC) should impress it on the universities and teaching hospitals to retain up to 75 or 80 per cent of their graduates to ensure that they have an internship position. 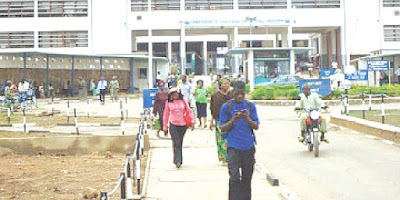 “The Medical and Dental Council of Nigeria (MDCN) needs to be proactive in resolving this situation where medical graduates wait for more than two years after graduation to get placement for internship,’’ he said. From Ondo State, Dr Ismaila Busari, the Secretary, National Association of Government General Medical and Dental Practitioners, called for the regulation of students being admitted into medical schools. Busari said that if MDCN could take this step, it would go a long way to mitigate the challenges of fixing young doctors for internship. “If admission into the medical schools is not regulated on time, the problem of fixing or getting doctors for internship will rise to an alarming rate. “Hospitals are scared of taking in many doctors on the programme because of the cost implications. “I do not think any hospital can pay less than N150, 000. Now, imagine having like 20 or 30 at a time,’’ Busari, who is a Senior Medical Officer in the state said. In Umuahia, Abia, Dr Nnamdi Ojimadu, says the revival of moribund state general hospitals across the country will create room for fresh medical graduates to serve their one year internship. Ojimadu, who is the chairman, Nigerian Medical Association (NMA), Umuahia Zone, attributed the worrisome development to the few number of accredited hospitals. He said that general hospitals in Aba, Ohafia and Uzuakoli were no longer functional. He added that the only accredited centres in Abia were the Federal Medical Centre (FMC), Umuahia and Abia State University Teaching Hospital. He noted that each accredited centre had its quota, ranging from 25 to 30, and that for any hospital to be accredited it must satisfy the standard laid down by the MDCN. Ojimadu said that at least 500 potential interns wrote the tests at FMC, Umuahia but regrettably, only 30 persons were taken. “There should be a synergy between the Federal, State and Local Governments to revive and equip the non-functional general hospitals and consultants to train the interns,’’ he said. Also, Prof. Paul Ezeonu, a former Chief Medical Director, Federal Teaching Hospital (FTHA), Abakaliki, appealed to government at all levels and wealthy individuals to rescue the nation’s health facilities. He decried poor subvention to the teaching hospitals, describing it as major constraint affecting the absorption of these categories of medical personnel. “Available records show that intake of medical and health graduates, including doctors, pharmacists and laboratory scientists for housemanship is on the decline. “Funds are not made available for the hospitals to engage these personnel for the programme in view of the huge cost involved in remunerating them,’’ Ezeonu said. A former Commissioner for Health in Ebonyi, Dr Zigy Nwagene, expressed regret that many medical students passed through difficulties in securing placement for internship. He identified inadequate funding of health institutions and limited space to absorb the large number of graduates for the programme as some of the problems. Nwagene urged government at all levels to increase budgetary allocation to the health sector to enable it to accommodate more medical students for the programme. From Benin, Edo, NAN learnt that medical doctors and pharmacists decried the inability of medical students to secure spaces for their one year compulsory housemanship/internship. Dr Omorogbe Owen, the president, Association of Resident Doctors, University of Benin Teaching Hospital (UBTH) Chapter, said that accommodation of graduate doctors for housemanship varied from one hospital to another. According to him, while some hospitals have increased the number being absorbed, others have reduced the number due to several factors. “I don’t have the current statistics for doctors on housemanship in UBTH, but I know there is a decline in the number being absorbed due to financial issues and personnel cost,’’ he said. A pharmacist on internship in one of the government hospitals in Benin, who pleaded anonymity, said the Nigerian factor had made it difficult for pharmacy graduates to undergo internship. According to the intern, you need to know someone before you can be absorbed in a government hospital to undergo the programme. She said that most of her friends, who graduated the same time with her, had yet to get spaces in hospitals for internship. In Lafia, Nasarawa State, some medical experts want the state government to build more medical facilities and upgrade the existing one to cater for the increasing number of patients in the state. Dr Omolei Friday, state chairman of NMA, said that fresh doctors usually encountered difficulties in getting where to undergo the one year mandatory housemanship in the state. Friday said that the difficulties were largely due to inadequate public health facilities to provide the training, mentorship and supervision of the interns.` `Apart from that, there is also inadequate number of required specialists and consultants that will train the interns. “If government at all levels can build more medical facilities and upgrade the existing ones, then medical students will have places to undergo their housemanship,’’ he said. Dr Egba Edego, the Chairman, Medical Development Committee of Dalhatu Araf Specialist Hospital (DASH), Lafia, blamed the challenges on the limited slots provided by MDCN and shortage of resources. Edego said that the number of doctors and pharmacists graduating every year from medical schools was more than the existing medical facilities. From Birnin Kebbi, NAN reports that the rejection of fresh medical doctors and pharmacists for housemanship and internship respectively, was due to limited spaces allocated to the hospitals by the regulatory bodies. Dr Balarabe Aliyu, the Head of Clinical Services, Federal Medical Centre (FMC), Birnin Kebbi, said that presently, only 12 medical students were absorbed at the centre. “The previous year, the centre received 12 students on housemanship but it has the capacity to absorb 24 to 30, but we were compelled to abide by the limit of the regulatory body,’’ Aliyu said. He said that the centre had applied for additional slots for doctors on housemanship for effective service delivery. Aliyu said the centre also built a 20-apartment hostel accommodation for medical students on training and they were placed on monthly salaries commensurate with what the policy stipulated. From Kaduna Zone, the survey indicated that no fewer than 2,000 medical doctors graduated without undergoing housemanship. A medical practitioner, Dr Abdulrahman Shehu, who is also the NMA secretary in the state, said that government at all levels should create more vacancies for doctors and pharmacists to undergo housemanship. He said that most general hospitals did not have the required manpower and equipment to enable the doctors to undergo their housemanship. “This is a pre-requisite for a doctor to acquire before he/she is registered, if not, the person cannot practice,’’ Shehu said. He said that private hospitals could also be upgraded and accredited for the medical doctors to use for housemanship. Shehu said: “We have a situation where doctors graduate and stay for over four months without securing a place for housemanship. In Kafanchan, Dr Zakka Musa, a private medical practitioner with Sauki Hospital, Kafanchan, urged governments to make it mandatory for the absorption of medical doctors temporarily in their places of primary assignment as National Youth Service Corps members. In Yenagoa, Mr Solomon Edere, the Director, Medical Laboratory Science, FederalMedical Centre (FMC), blamed insufficient health facilities for the inability to absorb fresh medical doctors and pharmacists for housemanship. Edere said that if adequate health establishments were available, many medical graduates would be absorbed for the mandatory internship or housemanship. “The main reason is that admissions into the universities are more than the training institutions on ground. “Government at all levels should initiate plans to overcome these challenges. “On our own part, we have been taking the number that we can accommodate. “Normally, we have 60 interns approved for us, but we cannot not take such a number because of limited available facilities,’’ Edere said. Also, Dr Godspower Eseimokumoh, the Director, Medical Science, Bayelsa State Ministry of Health, said the ministry was up-to-date in absorbing fresh medical doctors, pharmacists and laboratory scientists for their internship. According to him, the Ministry of Health in Bayelsa absorbs 300 fresh graduates annually and has taken the number for 2015. “Well, absorbing them depends on what is in the budget, we do not restrict them, but we are doing things according to budget. “We are taking 150 doctors, 75 pharmacists and 75 for medical laboratory scientists, totalling 300 in the ministry,’’ the director explained. The NMA Chairman in Bauchi State, Dr Muhammad Yusuf, blamed the Federal Ministry of Health and MDCN for the restriction placed on the training of house officers at a given time. Yusuf said that as a result of this, most house officers had to wait for one year in some cases before proceeding for their training. He said that each training institution was expected to train house officers in four departments — Gynaecology, Obstetrics, Paediatric and Surgery — for a period of three months each. “Therefore, since the number of graduating students is increasing, they probably have to wait for those that are already receiving their training,’’ Yusuf said. The story is not different in Katsina State as Dr Kabir Suleiman; NMA Chairman, says that lack of adequate training centres was militating against the absorption of fresh medical doctors and pharmacists for housemanship. Suleiman said that there was a criteria set up by the regulatory body for a hospital to qualify as a training centre for fresh doctors and pharmacists. He said that before a hospital could qualify to serve as a training centre, it must have consultants that would train the new doctors. He said that the situation had impacted negatively on some health institutions in the northern part of the country. According to him, Katsina State has shortage of medical doctors due to the mass movement of doctors and consultants out of the state and lack of training centres for fresh doctors. Suleiman appealed to the regulatory body to provide more training centres for the doctors and pharmacists to enable them to contribute to the development of the nation. Some of the affected interns expressed their displeasure over the unpleasant situations they were passing through in seeking for placement. Mr Martins Francis, a final year medical student at Usman Danfodio University, Sokoto, urged unemployed doctors to take advantage of their period of waiting to acquire additional qualification. “The world is increasingly becoming competitive and as such, one must be up to date to have an edge over his or her peers,’’ Francis said. Also, two final year medical students at the Lagos State College of Medicine, appealed to the federal and state governments to build more hospitals that would absorb more house officers. One of the students, Mr Moses Ibrahim, said that he applied for internship at the LUTH in September with the hope to be absorbed. “If I am given the licence and I do not get a placement by December, 2016, my licence will expire. “What it means is that I will have to apply for another examination to be conducted by MDCN. “It is really a challenging experience for house officers,’’ he said. Another student, Mr Yusuf Abdusalam, appealed to governments at all levels to build more hospitals. “I also applied at LUTH and about 1,000 house officers applied in the same institution and the chances are very slim. “Most house officers concentrate more in the Southern part of the country to do their housemanship due to the crisis in the North-East. “This is a contributory factor to why there are more house officers looking for placements where there are no facilities to work,’’ he said. Also, Mr Ogbonnaya Chukwu, an intern at FMC, Yenagoa, attributed their ordeals to “too much politicking in the health sector’’. According to him, politics that is inherent in the hospital management boards and small size capacity of the laboratories are major contributing factors. “Some hospitals are in the habit of selling forms to thousands of candidates and end up taking less than 30. Another intern, Mr Joe Anya, blamed the situation on poor funding of health institutions. Also, Chinazam Onwusiribe, said that many hospitals were willing to absorb interns within the limit of their resources and urged the Federal Government to increase funding of the institutions. “Engaging interns for the one year training is additional burden to the hospitals. “Although, they may be willing to take as many as possible, they are constrained by the paucity of funds,’’ Onwusiribe said. Reacting, Mr Moses Onwe, a graduate of laboratory science, University of Nigeria, Nsukka, said that since 2013 when he graduated, he had yet to find an approved health institution for his housemanship. Onwe urged the medical bodies to do the needful to alleviate the sufferings being faced by fresh medical graduates in searching placements in institutions. He said they needed a document to prove that they have undergone the programme in their respective profession and become qualified professionals. “If you go to any hospital or health facility looking for a space for your housemanship, all you will hear is that there is no space or the hospital has no money to pay,’’ Onwe said. 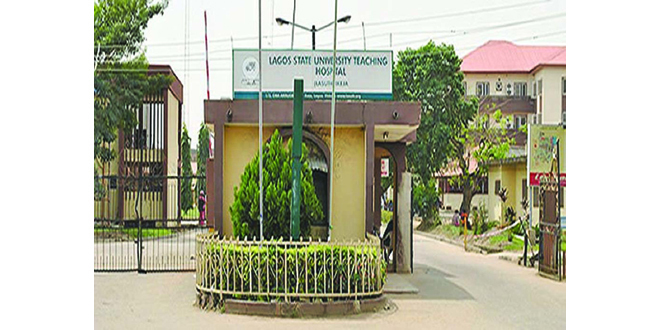 But Dr Ayoade Adedokun, the Chairman, Medical Advisory Committee of LASUTH, said there was need to increase the number of hospitals that would absorb house officers. “I do not believe we have enough institutions to take them on as interns and house officers. “Some of the reasons are that we need certain calibre of senior doctors to oversee the work of these officers; unfortunately, we don’t have enough of those doctors. “We must pay the house officers some allowance, because it is a tedious period for them; it is also a problem as not many hospitals are ready to pay them,’’ he said. He disclosed that LASUTH was in the process of interviewing about 300 house officers of which the institution planned to absorb about 80 of them. He said: “Again, there is an accreditation to be done by the MDCN because no hospital can take more than what is allowed by the council. This story was published in Newswatch Times on January 9, 2016. The celebration of one of the star babies of this year in Lagos came with a difference. The reason is simple; the baby’s birth took place in the same hospital where the First Lady of Lagos State, Mrs. Bolanle Ambode was born some decades ago. The bundle of joy was the baby girl of Mrs. Amarachi Bright, whose birth took place at 12:01am at the Epe General Hospital, Lagos. 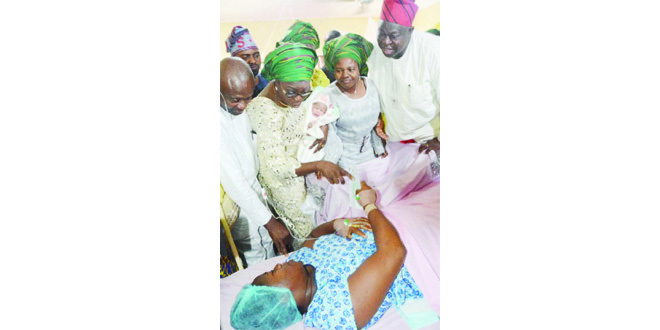 Cuddling the baby in her hands, Mrs. Bolanle Ambode stressed the need for all mothers and caregivers to promptly register the birth of their infants on successful delivery, during her goodwill visit to the public hospital to welcome the First Baby the Year 2016.
and (right) Special Adviser on Primary Health, Dr Olufemi Onanuga. According to her, the objective of the visit was to celebrate the new born in the community as well to celebrate some members of the public who find themselves in hospitals on the New Year day. 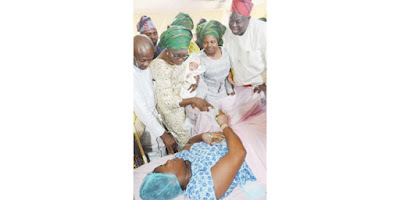 Mrs. Ambode also said that Baby Bright, who weighed 3.25kg, emerged the first baby of the year as she was delivered 12.01a.m at the General Hospital Epe on New Year dawn. Mrs. Ambode also named the baby – Abiodun Bolanle Bright after her. Similarly delivered at 12.01 am at the Lagos Island Maternity Hospital – Lagos is Baby Okunowo who weighted 3.25kg. Following closely is Baby Adeleke who was delivered at 12.03am at Ibeju-Lekki. Mrs. Ambode who was accompanied on the visit to the newly delivered babies at the three various hospitals by wives of the officials of Lagos State Officials (COWLSO), presented gifts to all the babies who were fortunate to be delivered very early on New Year day. Not only has medical science established that, breast milk supplies the much needed nutrients to the new born, she said. She also congratulated the health family for the re-appointment of Dr Jide Idris as the Commissioner for Health and Dr Femi Onanuga as Special Adviser on Primary Healthcare, saying the duo were crusaders of change in the health sector. She expressed optimism that their wealth of experience had been brought to bear in the delivery of qualitative healthcare and upgrade of facilities in the general hospitals and healthcare centres in the state. She also commended corporate organisations and individuals who had continued to support the health family over the years as part of their corporate social responsibility.to boost the healthcare delivery system in the state, ‘’ Mrs. Ambode said. In his remark, the Commissioner for Health in Lagos, Dr. Jide Idris said both the primary duty of Lagos State Government is to provide a healthy Lagos community, adding that the health workforce and government has responsibility to patients. According to Idris, the new administration in Lagos State is determined to improve all negative indices as well as improve positive lifestyles including personal hygiene. The Commissioner for Health noted that there had been tremendous improvements in the health services of the state through the adoption of solid strategies and interventions. Idris urge mothers to make use of the available hospital services by attending ante-natal and post-natal care, immunisation, and imbibe good diet and hygiene. He also called on mothers to access family planning services at the primary health centres for adequate child spacing and survival, to reduce infant mortality. Segun Olulade, chairman, Lagos State House Committee on Health, called for incentives for all health workers to encourage them to accept working in rural areas so as to bring health care closer to the polulace. This story was published in Newswatch Times on January 7, 2016. As part of its effort to ensure that tenets of good pharmacy practice is strictly adhered to, the Pharmacy Society of Nigeria (PSN) has warned pharmacists in all cadres to be ready to comply with payment of their practicing fees in view of section (14(1) of the PCN Act or face conviction. In a statement made available to Newswatch Times, the National President of PSN, Pharm. Ahmed Ibrahim Yakasai, stressed that section (14(1) of the Pharmaceutical Council of Nigeria (PCN) Act stipulates that conviction is penalty for payment defaulters. Section (14(1) of the PCN Act states: “No registered person shall practice as a pharmacist in any year unless he has paid to the Council in respect of that year, the appropriate practicing fee which shall be due every January. “It is important to inform members of the PSN that after due consultation with the PSN NEC, the PCN has taken a bold decision to invoke the provisions of section 14(6) of the PCN Act which posits that “any pharmacist who in respect of any year without paying the practicing fee practices as such is guilty of an offence and is liable on conviction,” Yakasai said. Similarly, the PSN President also warned chemist or selling dispenser who fails to comply with the provisions of the PSN Act to be ready to face the law, stressing the need for every them to comply with the statutory/legal imperatives of the relevant pharmacy laws which include the proviso in part II section 4(1) and (2). According to him, the proviso of the act states inter-alia: “4(1) A selling dispenser shall in the month of January in each year sent to the Registrar a list of all the premises (form B) where his business, so far as it comprises the sale of drugs is being carried on and the name of the selling dispenser or chemists having the personal control (form J) of the business on each premise. Yakassai further reiterated its directive for all pharmacists and pharmaceutical companies to fulfill the protocols of regularizing their membership of PSN following which they would be issued clearance certificates by the respective state branches. The PSN boss said its yearly payment of practising fee to the council is geared towards achieving the desired goal of the body, stressing that penalties are attached to defaulters. He however pleaded with stakeholders to give its maximum cooperation to ensure the success, adding that it will aid smooth operation of the arrangement in the ultimate professional and public interest. He said: “This is particularly key to achieving a faster pace of licensure of practitioners and pharmacy facilities to ensure that the tenets of Good Pharmacy Practice (GPP) are entrenched for consumers of health in Nigeria. Yakasai stressed that the clearance certificates will subsequently serve as a criteria for obtaining the statutory forms B and J at the state/zonal offices of the PCN by all players. Stakeholders in the health sector were shocked at the paltry N221.7 billion appropriated to the industry which is far below the N900 billion they had envisaged. Experts had expected a total health budget to be higher than previous years considering the numerous challenges facing the sector. Though the 2016 budget of N6.08 trillion is big on capital spending -N1.8 trillion, compared with N557 billion appropriated for capital spending under President Goodluck Jonathan last year, capital spending on health is still uncertain, including how to go on with the new-fangled zero-base budgeting. For instance, cost of immunising Nigeria’s children. Vaccines and the services that surround immunisation next year will cost $1.4 billion, according to official estimates. At N197 to a dollar, that’s N275.8 billion. In context, $1.4 billion is one-sixth the worth shaved off Aliko Dangote’s fortune since February by a combination of naira slump and falling stock prices, according to Forbes. Getting the vaccines could be some headache for the National Primary Health Care Development Agency, which coordinates immunisation nationwide. NPHCDA said it has “secured” a $148 million from GAVI – the Global Alliance for Vaccines Initiative, which helps procure and move vaccines around the world. A counterpart $166 million from federal government is uncertain, and so is the rest of the money. Watchers of Nigeria’s health sector have therefore expressed fears that Nigeria’s health service delivery could get worse in 2016 due to insignificant allocation, which they said would be worsened following the withdrawal of international donor agencies support in an area like HIV/AIDS. According to them, paucity of budget has become a common feature of the country’s health budget which many of them expected will vary especially with the ‘Change’ agenda of President Mohammadu Buhari. However, to their chagrin, Buhari on Tuesday said N221.7 billion would be spent on health sector in 2016 as part of the initiative to improve the health care delivery to Nigerians. Buhari said this while presenting the 2016 budget to the joint National Assembly session in Abuja. The numbers have been crunched and the budget is in, but it is set to leave health stakeholders in jaw-dropping shock. Health was only mentioned once in President Muhammadu Buhari’s entire budget speech before the National Assembly on Tuesday – and that in connection with recurrent expenditure. Now analysts are left in the cold. Analysts have therefore expressing disappointment, further recalled that N262 billion (1.7Billion USD) was allocated to health in Nigeria’s 2014 budget; of which 82 per cent was on recurrent expenditure. The N262 billion allocated to health was about six per cent of the total budget and second only to defense, education and finance (finance includes debt servicing). It was slightly less than the N279 allocated to Health in 2013. The 2013 budget allocation to the healthcare sector, on a per capita basis, was N1, 680 as against a World Health Organisation (WHO) recommendation that governments spend a minimum of N6, 908 per head, on providing healthcare services to their citizens. The gap of N5, 224 per head at the Federation level was too wide to be filled by autonomous spending fr0m state governments, according to findings. The 2013 budgetary allocation to healthcare delivery was made even worse by the fact that 77 percent or N77 of every N100 allocated to the Ministry, was spent on paying personnel employed in the sector, leaving just N20 of every N100 spend, for capital expenditure incurred by over 50 Federal Medical Centres and Teaching hospitals across the federation and just N3 of every N100 budgeted for healthcare to cover overheads incurred. With this structure of allocation, analysts observed that it was not surprising that these medical centres found it difficult to maintain existing facilities or acquire modern medical equipment. This explained the high tendency for political office holders and affluent Nigerians to travel abroad to take care of their healthcare needs, leaving Nigerians who cannot afford to travel abroad to use the poorly equipped and resourced hospitals in Nigeria. Nigeria’s healthcare spend per head, which the 2012 World Health Statistics report puts at US$67, is even more insignificant, when compared with that of developed countries. The United States healthcare spend per head stands at $7000, that of Switzerland is US$6000 while the average healthcare spend per head among countries of the Organisation for Co-Operation and Development (OECD) is put at US$3,600. A fallout of the low government spend on healthcare, is that Nigerians are forced to pay for healthcare delivery directly from their incomes at the point of getting healthcare services. This is classified as out of pocket expenses by the WHO, a major indicator of the state of healthcare delivery in a country. The report showed that out of pocket expenses in Nigeria, which accounts for 65 per cent of the total healthcare expenses in the country, is one of the highest in Africa. For example, out of pocket expense in Ghana is 29 per cent, in South Africa it is just 17 per cent, while it is just 10 percent in Angola. The danger of high out of pocket expenses is that it could lead to financial ruin, or in some tragic circumstances death, where the patient is unable to afford the immediate cost of healthcare. Nigeria, the report further showed, already has one of the worst healthcare statistics in Africa. An average of 143 children of every 1,000 births die before their fifth birthday in Nigeria, figures from the 2012 World Health Statistics show. Newswatch Times investigation shows that the only place worse than Nigeria for a child to be born is Angola, among comparative countries. The African average is 119 for children dying before their fifth birthday. In Kenya, the average is 85, in Senegal 75, in Ghana 74 and in South Africa 57. Nigeria also has one of the worse life expectancy rates for adult survivors of early childhood death. The average Nigerian had a life expectancy of just 54 years in 2009, just about the average in Africa, but well below 62 years for Senegal and 60 years for Ghana. This story was published in Newswatch Times on December 31, 2015. 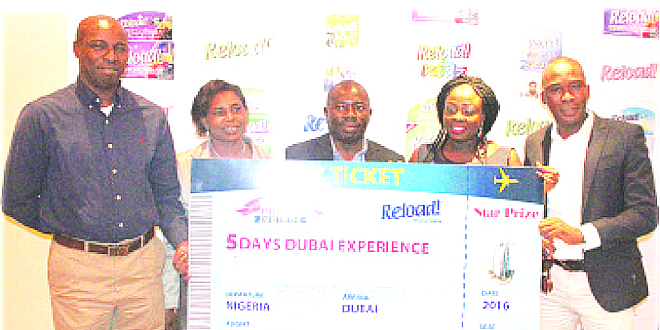 The long awaited Reload Multivitamin Win -Win promo raffle draw, which was held among Pharmaceutical companies in the retail segment of the market, ended last Wednesday with 27 persons emerging as winners. 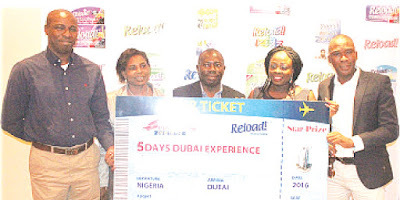 The promotion which started in the month of September ended in December 2015 with a raffle draw event which produced winners of the various prizes including, the grand prize of an all-expense paid trip to Dubai. The highpoint of the event is the emergence of Ikymavian Pharmacy Nigeria Ltd, Shomolu, Lagos as the grand prize winner of the all-expense paid trip to Dubai out of over 250 participants/retailers. The draw was picked by Mrs. Abiola Paul Ozieh the Chairman of Association of Community Pharmacist (Lagos Branch) and special guest of honour at the Reload Multivitamin raffle draw event. She commended Reload Multivitamin for engaging the retailers as well as rewarding them for supporting the brand. Raffle Draw held at Protea Hotel, Ikeja, Lagos on Wednesday. ‘He stated that the excited retailer will be allowed to decide his preferred time for the trip to Dubai, while other winners will be contacted to pick their prizes. The Reload Multivitamin range of products has been developed as food supplements to make-up for vitamins and mineral deficit. “Reload Multivitamin contains 24 fruits and vegetables. Taking one tablet daily would give you all the nutrients you need on a daily basis. Taking it in the morning will keep you ‘Reloaded’ for the entire day. “Our wide range of products include: Reload Men’s formula, Reload Men’s 50+ Formula, Reload Women’s Formula, Reload Women’s 50+ Formulas, Reload Extra formula, Reload Immunity Formula, Reload 4 Kids Tablet, Reload 4 Kids Syrup and can be purchased in any of the pharmaceutical outlet around”. The Reload 4 Kids ranges are fortified with vitamins and minerals along with fruits and vegetables. Reload will grow with your child with different formulas for different phases of life. It comes as chewing tablet for kids and liquid drop for babies. The Reload Infant Drops particularly help in cognitive development in infants. “While the Reload Immunity is a balanced nutritional supplement that works to help your body ward off disease, bolstering the seven critical immune systems in your body,” he said. Critical care services in Nigeria like other West African countries had been hampered by government apathy towards funding of hospitals capital and manpower flight overseas. Recently, things are somewhat improving with the government’s willingness to invest more in healthcare, and clampdown on resource diversion in the country. To save capital flight overseas and provide improved health care services, the 68 Nigerian Army Reference Hospital Yaba (NARHY) Lagos under the Command of Brig. Gen. CB Wanda, Consultant ENT Surgeon last Tuesday, Commissioned the Intensive Care Unit (ICU) of the hospital during its annual medical lecture. Speaking during the occasion, obviously elated Wanda, the Commander of 68 NARHY said that the new Intensive Care Unit is meant to serve both military and civilian patients of the hospital who are in need of critical care. Intensive care units cater to patients with severe and life-threatening illnesses and injuries, which require constant, close monitoring and support from specialist equipment and medications in order to ensure normal bodily functions. According to him, the era of moving patients from 68 NARHY to other hospitals like Lagos University Teaching Hospital (LUTH) to obtain similar services is gone. To this effect, the Ear, Nose & Throat (ENT) surgeon said that the hospital is now fully equipped and ready to serve patients with severe and life-threatening illnesses and injuries, which require constant, close monitoring and support from specialist equipment and medications in order to ensure normal bodily functions. Consultant Ear, Nose and Throat (ENT) Surgeon/ Commander of 68 Nigerian Army Reference Hospital Yaba (NARHY) Lagos cutting the tape during the commissioning of the Intensive Care Unit of the hospital, last Tuesday. He also said that the 68 NARHY ICU is staffed by highly trained doctors and nurses who specialise in caring for critically ill-patients. It is also distinguished from normal hospital wards by a higher staff-to-patient ratio and access to advanced medical resources and equipment that is not routinely available elsewhere, he said, adding that common conditions including, Acute Respiratory Distress Syndrome (ARDS) trauma, multiple organ failure and sepsis can now be treated at 68 NARHY ICU. He also explained that patients may be transferred directly to an intensive care unit from an emergency department if required, or from a ward if they rapidly deteriorate, or immediately after surgery if the surgery is very invasive and the patient is at high risk of complications. Highlights of the occasion were the lectures presented by the Corps Commander Medical, Maj. Gen. OA Ogunbiyi CMH and the guest lecturer, Dr Ibironke Desalu, Associate Professor of Anaesthesia of the Lagos University Teaching Hospital. 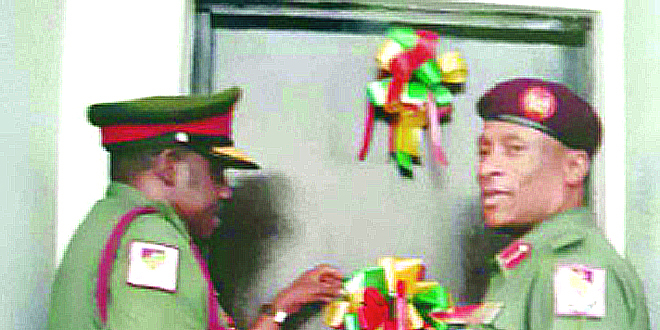 Wanda who is the Commander of 68 NARHY further observed that the Intensive Care Unit was developed by the previous Commander Maj. Gen. PAA Falola, Consultant, Ophthalmology and completed by him. He encouraged those who have patients in need of intensive care to avail themselves of the opportunity presented by the new Intensive Care Unit. Commenting, the guest lecturer, Dr. Desalu, that this is good and landmark development in the management of the critically ill patients and commended 68 NARHY for such an achievement. The first ICU in Nigeria was established at the University of Nigeria Teaching Hospital (UNTH), Enugu, in 1973, following the successful management of cardiac surgery patients there. Subsequently, other Federal Universities/tertiary care centres developed their own ICUs. The ICU was commissioned by the Maj. Gen. Ogunbiyi alongside the guest speaker and other guests in attendance. The memorable event was attended by eminent scholars from many private, specialist and public hospitals, including LUTH, National Orthopaedic among others. It was a moment of double honour for Prof. Ujah Innocent, the Director General (DG) Nigerian Institute of Medical Research (NIMR), Yaba, Lagos as he was conferred with two awards by Arewa Youth Assembly (AWA) and Northern Youth Council (NYC) in one occasion. 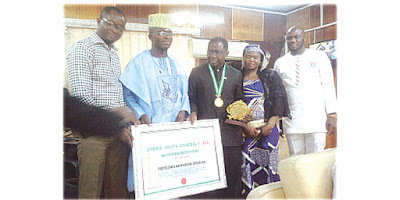 Conferring him with the award on behalf of the Arewa Youth Assembly (AYA) Dogo Shagari, Deputy Speaker, AYA, said that Ujah was being honoured because of his exemplary leadership. “Sir Ahmadu Bello Platinum Leadership Peace Award,” to Ujah by AWA in his office, recently. The Arewa Youth Assembly is a pro-democracy group of northern Nigeria extraction, who share a common vision of political, social and economic unity of the entire Nigeria. It is the umbrella legislative body of all youth organizations in northern Nigeria. The Deputy Speaker further said that AYA is a generation of young men and women that actively engage the society and recognize individuals who have made positive marks in their careers and contribute to human upliftment. Shagari also explained that this was why his group decided to honour the NIMR DG. Extolling his qualities and the invaluable contributions to the society, the Deputy Speaker said that NIMR contributed immensely during the fight against the deadly Ebola Virus disease, under his leadership. He added: “This honour is our little way of saying well done, and to spur you to do more and ensure that the health sector through research is well positioned and in line with global health standards. Similarly, Isa Abubakar, President, NYC, eulogizing the sterling qualities of the NIMR boss, urged him to act as a champion to rally other professionals and eminent persons from to join in the fight against Boko-Haram and the insurgency. Abubakar lamenting the effects of the insurgency, said it has impoverished the Northern region, especially the North East area, where the mutiny is at its peak, and expressed optimism that Ujah as an epitome of Northern community scholars would mobilize others to stop Boko-Haram attacks. Bemoaning the untold hardship, unemployment among the calamities which the insurgency has brought on the Northerners, the NYC President, further implored Ujah to ensure that all hands are on deck to end the crisis. Ujah’s award is just one out of his long list of award in recognition of his valuable contributions to improve medical research and services. 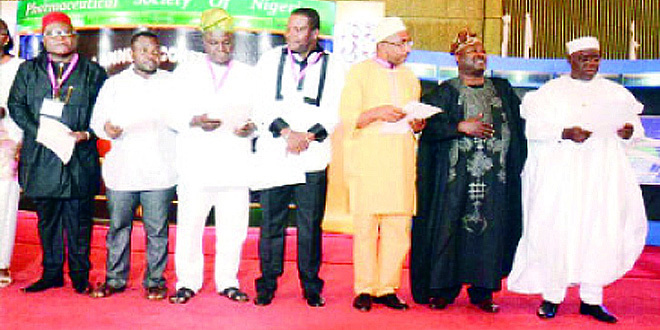 Professor Ujah, was among the four persons who were honoured APBN during the association’s 29th Annual General Assembly (AGA) awards which held at Golden Gate Restaurant, Ikoyi. Born on November 6, 1954 at Aidogodo-Okpoga in Okpokwu , Local Government Area (LGA) Benue State, Professor Ujah graduated from Ahmadu Bello University (ABU), Zaria in June 1978 with an MBBS degree. He is a fellow of Medical College of Obstetrics & Gynaecology (FMCOG) of the National Postgraduate Medical College of Nigeria by examination, Fellow of International College of Surgeons (FICS) and Royal Society of Medicine of England (FRSMed). Professor Innocent Ujah is a specialist gynaecologist, endocrinologist and endocrine infertility. He also holds a Diploma in International maternal health care from University of Uppsala, Sweden. Professor Ujah has published over 70 scholarly articles in reputable national and international peer-reviewed journals, in addition to over 100 conference papers, abstracts and has delivered many lectures. He has attended many national and international conferences and presented a number of quality scientific papers.